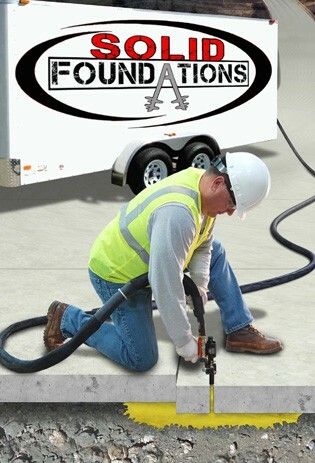 Solid Foundations provides experience and expertise in repairing sink holes to the residents of Tampa. We understand Tampa’s terrain and provide special attention to ensure we fix your sinkhole problem correctly and safely the first time. Florida is susceptible to sink holes because of the states underlying terrain of carbonate rock. Sink holes are a cavity or hole in the ground, caused by water erosion. Some happen naturally while others are man-made. Tropical storms and heavy rainfall can contribute to the forming of a sink hole. While man-made sinkholes can be the result of drilling, excavation and heavy pumping of groundwater for agriculture. Collapse Sink Holes – A hole is created in the limestone which leaves a funnel shaped sink hole. These sink holes can occur suddenly and are effected by human activity. They occur more frequently where there are caves. Solution Sink Holes – These occur more slowly and gradually. The bedrock is exposed which subjects it to weathering and disintegration. Subsidence Sink Holes – Bedrock is covered by soil and materials that are not closely knitted together. The sediment gradually flows into the cavity. • Compaction grouting – Our professionals add a thick mixture of cement and grout deep into the soil. This erases the damage by filling the hole and seals the top layer of limestone to avoid future sink hole problems. • Void Filling – Our professionals lift and repair the concrete slabs on your property. We use a polyurethane foam beneath concrete slabs or behind below grade concrete structures which seals any empty spaces steadies the concrete against outside forces. Please call Tampa’s leading experts if you suspect a sink hole problem or are in need of a sink hole repair. Solid Foundations can be reached at (855) 227-0300 to provide you with the service you deserve. Click here for more info.